Silver Peak OrchestratorSP is a secure, cloud-hosted, multi-tenant management Software-as-a-Service that enables service providers to centrally manage and monitor their managed SD-WAN service offerings on a global basis. 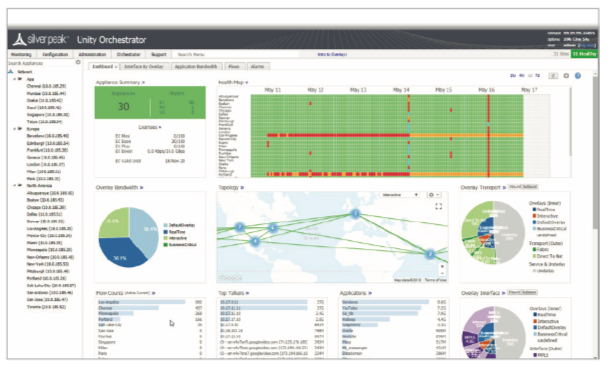 An intuitive graphical user interface (GUI) provides unprecedented levels of visibility, control and management for 1,000s of individual customers with the unique ability to centrally configure and manage secure SD-WAN deployments that are customized for each individual enterprise customer. Service providers face unprecedented demand for managed SD-WAN services and selecting an intuitive and flexible SD-WAN management platform can dramatically accelerate service deployments. OrchestratorSP generates unique customer Orchestrator tenants to ensure flexibility in tailoring deployments to individual customer requirements. It securely isolates each customer’s SD-WAN configuration and performance statistics providing to assure robust security. Each tenant Orchestrator enables secure zero-touch provisioning of Unity EdgeConnectTM appliances in each customer’s branch sites, providing full visibility, control and management of the entire SD-WAN service deployment. When branch offices are deployed as part of an SD-WAN or hybrid WAN, some applications may require higher performance levels, like accelerating replication data over distance for disaster recovery. The optional Unity BoostTM WAN optimization performance pack enables service providers to create tiered WAN service offerings that can be offered as a value-added software service on any EdgeConnect appliance. With a single mouse click in the Orchestrator GUI, service providers can enable enterprise customers to utilize Boost to accelerate application performance where and when it is needed. The EdgeConnectSP SD-WAN solution also offers the option to service chain with third-party security appliances for additional traffic inspection to ensure a robust and secure SD-WAN solution. Orchestrator includes a drag and drop interface that enables service providers to automate and accelerate the service chaining of industry leading security partners’ advanced services (e.g. Check Point, Fortinet, Palo Alto Networks, Symantec), secure web gateways (e.g., Zscaler, McAfee, Forcepoint and OPAQ Networks), and secure DNS (e.g., Infoblox) utilizing private secure encrypted IPSec tunnels. Easy license management for provisioning licenses, upgrading or downgrading licenses with no service disruption to enterprise customers. Orchestrator tenants are isolated and independent from each other. Different tenants can run different releases and be upgraded on any schedule, any time. Flexible billing options for service providers. For example, WAN optimization capabilities are enabled on an as needed basis from the Orchestrator. Boost is licensed on a per-mega-bit-per-second, per-month basis, so customers do not have to pay for WAN optimization across all sites within their wide area network. The latest scale-out technologies providing virtually unlimited scalability as the number of tenants grows. It also supports a metered pay-as-you-grow pricing structure for managed service providers. 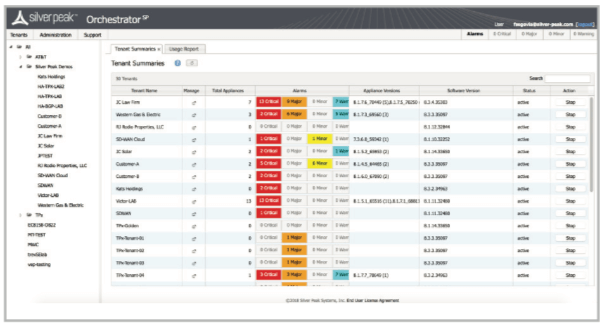 Service providers can resize the Orchestrator tenant on-demand, by allocating additional resources, to accommodate larger SD-WAN deployments. OrchestratorSP is a comprehensive multi-tenant, highly intuitive management platform for service providers that require scale-out deployments for managing large numbers of managed SD-WAN service customers. It incorporates all of the robust capabilities of the Silver Peak enterprise Orchestrator single tenant management platform. OrchestratorSP provides an unprecedented level of operational efficiency by minimizing order-to-deploy- ment touch points with an intuitive GUI and cen- tralized SD-WAN configuration. It provides granular > visibility into customer networks enabling rapid response for troubleshooting and support issue resolution.